A centimetre (international spelling as used by the International Bureau of Weights and Measures; symbol cm) or centimeter (American spelling) is a unit of length in the metric system, equal to one hundredth of a metre, centi being the SI prefix for a factor of 1/100. 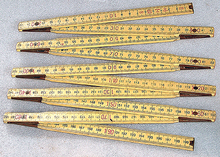 The centimetre was the base unit of length in the now deprecated centimetre–gram–second (CGS) system of units. Look up centimetre in Wiktionary, the free dictionary. For broader coverage of this topic, see metre. Though for many physical quantities, SI prefixes for factors of 103—like milli- and kilo-—are often preferred by technicians, the centimetre remains a practical unit of length for many everyday measurements. A centimetre is approximately the width of the fingernail of an average adult person. One millilitre is defined as one cubic centimetre, under the SI system of units. as the inverse of the kayser, a CGS unit, and thus a non-SI metric unit of wavenumber: 1 kayser = 1 wave per centimetre; or, more generally, (wavenumber in kaysers) = 1/(wavelength in centimetres). The SI unit of wavenumber is the inverse metre, m−1. They are mostly used only with East Asian fixed-width CJK fonts, because they are equal in size to one Chinese character. ^ "Decimal multiples and submultiples of SI units". Bureau International des Poids et Mesures. 2014. Retrieved 5 July 2015. ^ CJK Compatibility excerpt from The Unicode Standard, Version 10.0.